India's first newspaper, founded in 1780, held up a mirror to British rule in India. It can also teach us about how tyrants work and how an independent press can stop them, writes journalist and historian Andrew Otis. 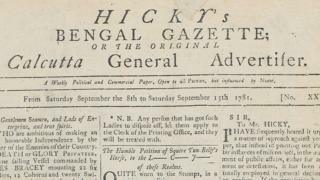 Known as Hicky's Bengal Gazette after its intrepid founder, James Augustus Hicky, the newspaper notoriously dogged the most powerful men in India. It dug into their private lives and accused them of corruption, bribery and abuse of rights. Among many claims, it accused the then ruler of British India, Governor General Warren Hastings, of bribing the chief justice of India's Supreme Court. It alleged that Hastings and his top aides launched illegal wars of conquest, taxed the people without representation and suppressed freedom of speech. The newspaper also reported on the lives of Europeans and the Indian poor - often news that its competitors would have ignored. It bonded with those at the lowest levels of colonial society, especially the soldiers who fought and died in the wars waged by the British East India Company. At the height of its power, the Company controlled large parts of India with its own armed forces. But it was disbanded after Indian soldiers in its army revolted against the British in 1857. The newspaper, in fact, called on the soldiers to mutiny, arguing that their throats were "devoted to the wild chimeras of a madman", a reference to Hastings. But soon the criticisms became too much for the government to stand. Those in power sought to discredit those who held them accountable. The East India Company funded a rival newspaper to control the narrative, while Hastings' surrogates resorted to ad hominem attacks, calling the newspaper "insolent" and referring to its writers as "pitiful scoundrels". Finally, when one of its anonymous writers argued that the "people are no longer bound to obey" when the government no longer consults their welfare, the East India Company moved to shut it down. Hastings repeatedly sued Hicky himself for libel. Hicky stood little chance in front of a bribed judiciary. He was found guilty and, despite printing his newspaper from jail for another nine months, the Supreme Court issued a special order to seize his printing press, shuttering India's first newspaper for good. Eventually the allegations of abuse of power and rights made it back to England. Armed with reports from Hicky's Bengal Gazette, the members of parliament launched an investigation. This resulted in the recall and impeachment of both Hastings and the Chief Justice of India at the time. The reports in Hicky's Bengal Gazette, and later, in the British newspapers, were instrumental in building public pressure against corruption. Like in the case of India's first newspaper, authoritarian leaders today seek to suppress the press. The source of their power is to convince enough of the public to believe them, and not what they read in the press. Politicians who want to be dictators are not new. But why are they so dangerous now? They have new tools to sow divisions between citizens. Facebook, WhatsApp, Twitter and other forms of social media have created "filter bubbles" in which people consume and share content they already agree with. The result is that people across the world are increasingly divided into tribes as social media allows politicians to communicate directly with their citizens. For instance, US President Donald Trump often lashes out at the news media with tweets, denigrating them as "fake news" and as "enemies of the people". Social media has also had a deadly effect in India, where a recent spate of mob lynchings were linked to child abduction rumours spreading over WhatsApp. Online trolls in India have also backed a Hindu nationalist agenda. Activists and journalists in the country were arrested in August and, in the fallout, many on social media termed them "anti-national" and said they were against the ruling Bharatiya Janata Party-led government. In such a tumultuous atmosphere, it is time for companies like Google, Facebook and Twitter to be accountable for their effect on society and to follow ethics guidelines that newspapers have followed for decades. Social media companies bear a responsibility to foster connections and dialogue - not division and hate. Dictators such as Hastings have come and gone. But these men set the stage for the subjugation of India. They created the political structure upon which British rule began. Through them, a subcontinent that is home to hundreds of millions came to be ruled by a company of a couple of hundred men. They gained legitimacy not only through the sword, but by controlling what others could write about them. Now we have democratically elected politicians who wield social media in the same way, using it to degrade the value of a free press and pit citizens against each other. The fight between Hastings and Hicky is not that different from the fight we face today. The only thing that has changed is the tools used to fight. Andrew Otis is the author of Hicky's Bengal Gazette: The Untold Story of India's First Newspaper, published by Westland. India activist arrests: Is this a political witch hunt?